Beyond the paved trail at the north end of the scenic drive in Zion National Park, the 2,000 foot cliffs of Zion Canyon become closer together until the water covers all of the canyon floor, and the Virgin River continues for many miles, trapped beneath the near vertical walls of Navajo sandstone. 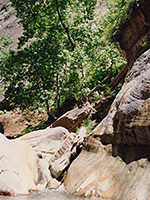 Hiking upstream is possible for several months of the year during summer and autumn when the water level is relatively low, although always the danger of flash floods caused by sudden thunderstorms can make the trip too hazardous; every day, the flood danger level is posted by the NPS at the start of the trail. Much of the time is spent wading in the river water, sometimes chest-deep, but generally less. Care is needed at many points when crossing between sand banks due to the fast current and the rocky river bed, but this is still an unforgettable experience, thought by many to be the premier canyoneering experience in Utah. 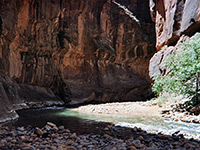 The starting point for trips upstream through the Zion Narrows is the former parking area at Temple of Sinawava, at the end of the Zion Canyon Scenic Drive; this has a fresh water supply and noticeboards with maps & weather information, at the start of a 1 mile paved trail (Riverside Walk) after which the narrows begin. Private vehicles are no longer allowed along the drive; instead hikers arrive at the trailhead via the free Zion shuttlebus, starting at the visitor center by Watchman Campground. 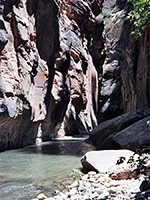 The reverse journey downstream requires a long drive (normally about 90 minutes) over unpaved tracks to reach a trailhead near Chamberlain's Ranch beside the North Fork of the Virgin River, above the start of the confined part of the canyon - this track is an extension of the road used to reach Orderville Canyon, and may be impassable during periods of wet weather. The distance between the two starting points of the Narrows hike is about 15 miles. Regulations for backcountry travel in Zion National Park are becoming ever more restrictive, but still no permit is required for day trips up the Narrows, just a standard $25 (2015) park entry fee. However, for all overnight or through trips a permit is needed, which from 2004 has been 1-2 people: $10, 3-7 people: $15, 8-12 people: $20. Some of these are issued in limited numbers the day before travel, subject to a favorable weather forecast, while others can be reserved in advance. Permits are only issued if the river flow is less than 120 cfs. 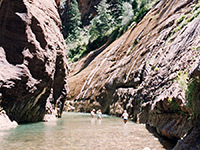 No groups larger than 12 are allowed in the Narrows, or anywhere else in the Zion backcountry. TopoQuest topographic map of the Zion Narrows. 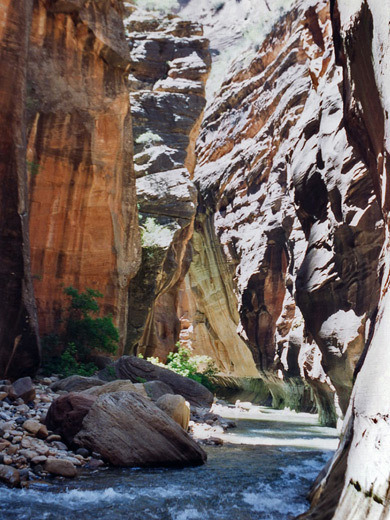 The Virgin River trail is the most famous narrows hike in the US due to the length and depth of the canyon, and the spectacular scenery. Still, many people walk just a short distance up the gorge since one of the deepest parts of the river is only 100 yards up from the end of the paved trail and so far fewer progress beyond this point. There are many sand banks and boulders at the edges of the canyon allowing for some walking on land but at least half the hike involves wading and on occasions even swimming through the river. This is not practical in winter but fine during warmer months, when the water temperature is generally high enough for hikers not to feel cold even when wet from head to foot, if they keep moving. The river twists and turns, passing a few tributaries that join high above, such as Mystery Canyon, end of which is marked by a pretty cascade over a near-vertical, moss-covered cliff face. 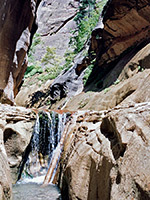 A good place to aim for on a half-day hike is Orderville Canyon, a long drainage that joins Zion Canyon from the east after 1.5 miles (2.5 miles from the trailhead). This too is a sheer-walled gorge, but has less water flowing through which enables quicker progress although it does have a few problematic pools and chokestones in the lower end. The deepest, narrowest part of the main canyon stretches for about two miles after the Orderville junction, then the cliffs gradually relent as sheer passages alternate with wider sections which have several designated places for camping. Other major side drainages, useful to gauge progress, are Goose Creek, Kolob Creek and Deep Creek. The walk in the reverse (southbound) direction is of course rather easier as it is downstream. The deep, enclosed section of the canyon extends for about 13 miles in total, and can be hiked in one day although the trip is quite strenuous and most people spend at least one night camping. A variety of one-way trips are possible as there are several dirt tracks outside the park boundary in the Kolob Terrace area to the northwest which lead to tributaries of the river including the major drainages of Goose Creek, Kolob Creek and Deep Creek so if a car shuttle is available all can be used as starting points for the main narrows hike. The tributaries are generally more difficult to follow, however, and need rappelling equipment in some places.